While rescue personnel prepare evacuation litters, two stand-in "astronauts" prepare to use an exit slide from a Shuttle mockup during a training exercise conducted by Edwards Air Force Base and NASA's Dryden Flight Research Center in California. While theupcoming launch of the space shuttle Discovery will mark the return to flightof NASA's space shuttle fleet, that is only the beginning, and great care isbeing taken to assure a successful mission throughout, particularly thelanding, wherever it might take place. To ensure asafe return of Discovery's astronaut crew, shuttle officials at NASA's Dryden Flight Research Center and Edwards Air Force Base have conducted training drills in the off-chance theorbiter makes a West Coast landing instead of touching down at Kennedy SpaceCenter (KSC) in Florida as planned. "We try tohave one major practice about every six months," said Joe D'Agostino,head of Dryden's shuttle support office, during a telephone interview. "Thatincludes getting the whole NASA, Air Force, Army and Navy team together topractice a contingency operation." 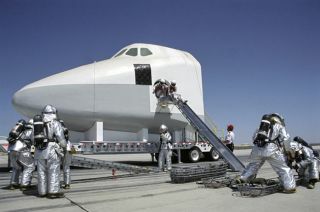 While KSCis NASA's preferred landing site for Discovery's STS-114 flight, as well as allshuttle missions since 1990, the space agency turns to Edwards Air Force Base,Calif. and White Sands, N.M. when weather conditions make a Cape Canaverallanding impossible. Thunderstorms, wind speeds and cloud ceilings will all playa role in whether shuttle flight controllers opt for a contingency landing,shuttle officials said. "Basically,what we're looking for is no thunderstorms and, obviously, no rain," saidSTS-114 ascent/descent flight director LeRoy Cain. "We're not going to risk flying through rain if it is within 30 miles (48kilometers) of KSC." Discovery'sSTS-114 mission is NASA's first bid at resuming space shuttle flights after the2003 Columbia accident that led to the loss of one orbiter and the deaths of all sevenSTS-107 astronauts. The Columbia orbiter broke apart during re-entry Feb. 1, 2003, about two weeks aftersustaining wing damage during launch. Shuttleengineers have spent the last two years revamping Discovery and its sister shipAtlantis to increase flight safety. They have also redesigned portions oforbiter external tanks to reduce the shedding of potentially damaging foamdebris. The Columbia Accident Investigation Board concluded that the wing wasbreached shortly after launch when it was struck by foam debris that fell offpart of the external tank system. Discovery is now set to launch toward theInternational Space Station (ISS) no earlier than July 13, 2005, and return toEarth about 12 days after liftoff. While NASAhas focused much of its attention on minimizing, if not eliminating the sametype of launch debris that doomed Columbia, there are new concerns for landings as well, NASA officials said. "If there'sthe possibility of debris coming off an orbiter, we'll want less exposure tothe public and that might favor a [landing] scenario at White Sands rather thanDryden or KSC," D'Agostino said. "Our first andforemost requirement [in addition to astronauts] is the safety of the generalpublic." Searchteams collected 83,000 pounds (37,648 kilograms) of the debris that rained downfrom the Columbia orbiter, primarily over Texas, as it crumbledduring reentry. "We werevery fortunate during the tragedy of STS-107 that we did not injure anyone onthe ground," D'Agostino said. IfDiscovery's STS-114 mission goes according to plan, the shuttle should land atKSC during daylight, though NASA officials said it is not a flight constraint. "We have adaytime launch constraint, which puts us in a daytime landing," Cain told SPACE.com. Shuttleofficials set the daylight launch constraint for Discovery's STS-114 flight,and NASA's follow-up STS-121 mission aboard Atlantis, in order to allow goodobservation conditions for ground and air-based cameras. Cain, whoalso oversaw Columbia's reentry, said Discovery's landing conditions must include at least five miles(8 kilometers) of range visibility, with cross winds not exceeding 15 knotsamong other constraints. The surface wind criteria, he added, protect theorbiter from putting too much pressure on its landing gear struts. The lastshuttle to land at Edwards was Endeavour during the STS-111 mission in June2002, but Dryden and military officials are always prepared to receive anorbiter. "It'sreally weather-driven," D'Agostino said, adding thathis crews are on alert when shuttle landings near. "We went four and a halfyears without a landing, and then had four in a row, so you never can tell." Originallytapped as the prime shuttle landing site, Edwards Air Force Base is fullyequipped with the necessary hardware and support crews to not only safeguard anorbiter after the wheels stop, but also turn it around shipment back to KSCatop a modified 747 aircraft. "That willbe the first site I look at, and primarily it's because there we have a littlebit better understanding of the weather," Cain said. "But more importantly,there is more support in the post-landing...[Edwards] is a fully augmented landing site." While WhiteSands is still a safe alternative, Edwards has history in its corner, NASAofficials said. There have been 49 shuttle landings there since 1981, as wellas test approaches and landings with the Enterprise vehicle in 1977. "We veryconcerned with [this] mission, and with it going to the ISS, we certainly wantto ensure that those crews get the best attention that they can," said D'Agostino of the shuttle astronauts.